For more than 20 years, the Arizona Diamondbacks ownership group, employees, players, and corporate partner alongside D-backs fans, have been “working together” and “giving back” to those who need a helping hand in our community. The Arizona Diamondbacks award-winning community efforts are focused on impact areas that include homelessness, indigent healthcare, veterans, education and children’s programs of all types. Product ships 1-2 weeks after the close of auction. You will receive a separate tracking email once your order ships. All net proceeds will be donated to charity. As of January 1, 2011 please note that all bid amounts for charity auctions are inclusive of applicable sales tax. Sales tax will be added to winning bids for auction items being shipped to Arizona. Tax will also be added to the winning bids for auction items that are picked up in each of these states mentioned. All International customers are responsible to pay for all applicable duty and customs charges. Your local government determines duty and customs charges depending on where the merchandise is made and what it is made out of. When placing an order on MLB.com, you are considered the importer of record and must comply with all applicable laws and regulations. Charges for duties, taxes and the carrier's collection fee are in addition to your shipping charge and must be incurred by you. You should contact your local customs office for further information. MLB.com Auctions accepts Visa, Mastercard, Discover, and American Express only; we do not accept checks, money orders, PayPal, or any other payment methods. If you are the winning bidder, the card you entered to bid will automatically be charged for this purchase. If you are a returning user please make sure that your credit card information is updated before bidding. As a courtesy we will attempt to contact you if your credit card is not processed successfully, but should it fail we reserve the right to cancel the transaction. 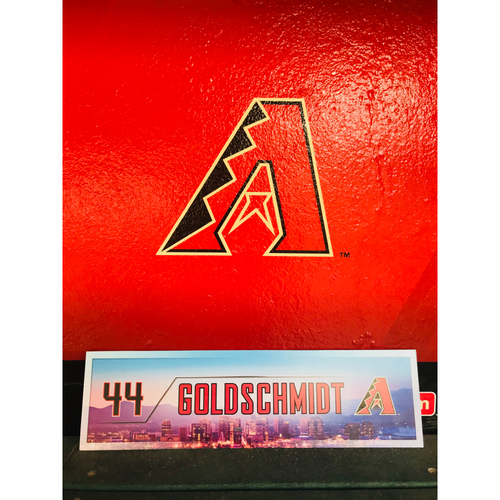 Items authenticated through D-backs Authentics will be made available for purchase at the sole discretion of the Arizona Diamondbacks. Availability changes quickly and items are never guaranteed. In addition, any information published or made publicly available by the MLB Authentication Program or its MLB.com Referencing System is not an offer for sale. Items listed in the MLB.com Referencing System may include items previously sold or items withheld by one or more MLB Clubs for internal use or for any other purpose in the discretion of the withholding Club. This information is for informational purposes only and designed to distinguish officially authenticated MLB memorabilia from other items on the market but is not a representation that any item is available for sale. Without limiting the foregoing, any items offered by D-backs Authentics are a contingent offer. For example, items offered for sale prior to a game may, during the game, achieve historical significance to Major League Baseball, the Arizona Diamondbacks, its individual players, and/or the National Baseball Hall of Fame. Accordingly, D-backs Authentics reserves the right, in its sole discretion, to cancel any pre-order based on the request of the Arizona Diamondbacks, its players/coaches/managers, Major League Baseball, or the National Baseball Hall of Fame. In such event, the applicable order will not be fulfilled and the full amount of any purchase will be refunded at the end of the game.